Here’s me being interviewed by Danish TV on the metro from the Bella Centre. While we felt a bit like bogans with our blow up kangaroos singing “c’mon Kevin, c’mon, c’mon”, we did get loads of attention. Day one UN climate change conference in Copenhagen. Braved the freezing cold to stand outside the conference centre. Posed for lots of photos, did interviews with media from France, Sweden, Demark, Germany. It was a pretty good day, given that we set out of the house in the morning with a serious resourcing issue. We had the blow up kangaroos, but no placards, cardboard, textas. We spent a good few hours looking for materials to make placards and finally found some cardboard in the skip bin outside a mega lego shop and bought some kids textas for an outrageous amount that I would rather not remember. But it paid off. We got heaps of attention and were definately the most interesting thing near the queue to get into the Bella Centre. 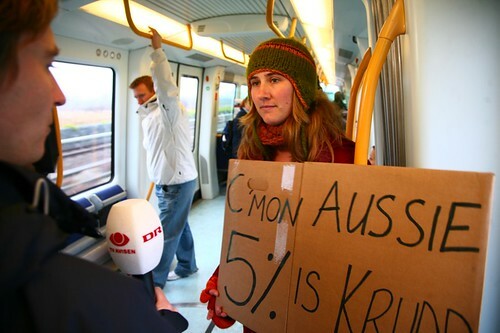 People were particularly intrigued that we were totally self-funded and not aligned with any organisation – just a bunch of aussies who cared enough to spend our holidays protesting in Copenhagen.